An African proverb says, "educate a girl, and you enlighten a whole community." Captain Trevor Greene took these words to heart when he met with Afghan elders to assess the needs of their villages. As a member of a Canadian Forces Civil-Military Cooperation Unit, Trevor asked if they had a school and if they were teaching girls. Despite the laughter from the elders, Trevor chose to hear their cackles as a call to action. It was in one of these villages that Trevor was struck in the head with an axe. That blow ended his mission as a soldier but his desire to help bring peace and prosperity to the Afghan people endured. In 2010, an unexpected $100,000 bequest from Vancouver property owner James Motherwell gave Trevor and his wife Debbie the seed money for the Greene Family Education Initiative. Their mandate is to fund scholarships for women in conflict zones to become teachers. And, to ensure that children have access to education to break the cycle of poverty that makes them beholden to their oppressors. 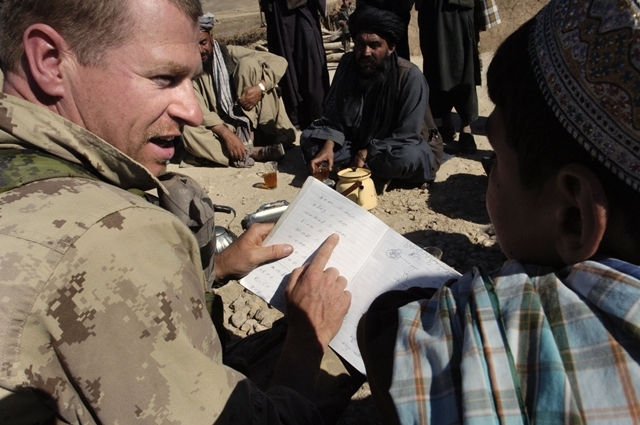 The initial scholarships will be awarded in memory of every Canadian killed in the Afghan War. The first will be the Bill Turner Memorial Scholarship in honour of Trevor's friend and colleague, who was killed shortly after replacing him. Trevor and Debbie invite you to help them make a difference in the lives of countless generations. They thank you for your support in helping launch the Greene Family Education Initiative.